It is with profound sadness that we announce the passing of our Trustee Emerita, Lyn Kienholz, who died at her home in the Hollywood Hills on January 25, 2019. She was 88 years old. A forceful arts advocate, Lyn was involved in the nascent postwar art scene in Los Angeles as she worked at the seminal Ferus Gallery and married artist Ed Kienholz (1966-1973). She met SPACES founder Seymour Rosen at the Ferus; he served as their staff photographer, documenting the exhibitions and installations of the then-unsung artists who would go on to stretch the definition of contemporary art in the 1950s and ‘60s. Lyn felt strongly that California artists hadn’t received the visibility or support that they deserved, and she founded the California/International Arts Foundation to remedy that lack; under the auspices of the C/IAF she organized and curated several exhibitions in Europe, including at the Pompidou Center for the Arts in Paris. She famously crossed genre areas in both her advocacy and her curatorial practice, championing self-taught artists as well as those with formal academic training in her exhibitions and publications. Following Rosen’s death in 2006, Lyn reached out to me and supported our early fight to ensure that all of the materials in SPACES archives were maintained together, so that they could be studied and understood in the holistic way that Rosen had approached all arts and cultural expressions. She formally joined our Board in 2006, providing wise counsel and support over that difficult transition. Lyn’s great gift was the ability to foster connections among individuals who might not otherwise come into contact with each other, and some of the folks that I met through her - most connected to the mainstream art world rather than our own more circumscribed sphere - became and remain staunch supporters of SPACES to this day. Donations in Lyn Kienholz’s memory may be made to SPACES; please contact me at jfh@cruzio.com for further information. What is frustrating about the outcome is that almost everyone in the room (even the Bride) seemed to agree with the historic criteria and that the building is an icon. Though hardship should have been dismissed for a second meeting, the final call was based on the Bride’s argument that designation would stifle their ability to move forward unencumbered. It was a disappointing day and if the building is demolished, I do believe in just a few years the city will be deeply regretting this decision. When I woke up on Saturday, I felt so proud of us. I know there was nothing we could have done differently: we were thoughtful, articulate, organized, and full of integrity. Fighting for art and for strange spaces will always be an uphill battle. Every single person on this email took time from their busy schedules to voice their opinion. Our communities will never understand what these places mean to us unless we continue to push back. Even facing loss, it is so important to try. So thank you. Reading your letters of support, getting fired up during phone conversations, the handshakes of respect after we lost- those were invaluable moments. I hope that you will continue to talk about the building and tell this story. Maybe next time it can be different for someone else. In terms of next steps, there are not many options. We will not be appealing or suing, it doesn’t make sense in this situation. I think it is time to focus our efforts on encouraging the Bride to find a sympathetic buyer. I’d love any suggestions you may have in terms of rallying the community to petition the Bride in this way. Raise your voice in support of Philadelphia’s Painted Bride! Learn more about Isaiah Zagar on SPACES! The L.A. Civil Service Commission will consider its final decision Thursday, September 13, on Watts Towers Arts Center Campus Director Rosie Lee Hooks’ appeal against the three-week suspension imposed upon her by the Department of Cultural Affairs. The final hearing will be at 10:00 a.m. in Room 350 of the L.A. Personnel Department Building, 700 East Temple Street. After a July 31 hearing, Ms. Hooks was found not guilty of insubordination, but guilty of not adhering to the public art approval process to paint a mural of Watts native son and jazz giant Charles Mingus, last September, on the Charles Mingus Youth Arts Center on campus. This finding has been called into question by substantial documentation proving that Ms. Hooks was unaware of this process, contradicting Community Arts Director Leslie Thomas’ testimony. Mr. Thomas admitted that he had approved Ms. Hooks’ vacation for the month of May, 2016, but insisted that she was definitely in attendance at the May 5, 2016, meeting where she was informed of the Public Arts Ordinance approval process. Lawyer Adam Stern, representing Ms. Hooks for her union, the Engineers & Architects Association (EAA), has submitted to the Commission an airline check-in confirmation and Ms. Hooks’ passport with a dated visa stamp for additional consideration. This material proves that, at the very time of the May 5 meeting, Ms. Hooks was in transit to Johannesburg, South Africa. An internationally-honored community arts administrator and educator, Ms. Hooks has served twice as interim Director of the Watts Towers Arts Center, and was appointed Director in 2002. She was previously Director of Festivals for the City’s Cultural Affairs Department and produced the first Central Avenue Jazz Festival and many others. She also established, with Buddy Collette, the prestigious Watts Towers Arts Center Jazz Mentorship Program. When the Cultural Affairs Department put Ms. Hooks on suspension without pay in April, the community support groups for the campus expressed concern that the action against her was an act of retribution for her continuing efforts to advocate for the Watts community. Watts Towers. Billy Reed, 2015. Click here to learn more about the Watts Towers, built from 1921 to 1954 by Italian immigrant Sabato Rodia. Many of the archive materials are only available in person - the archive boasts many books, publications, and other resources about sites around the world. Ann double checks all files to remove staples and paperclips, which can rust. She then transfers everything into archival folders. Ann has been delving into the vast amount of materials that lie within the “Art” Harold Beal collection. Art Beal created Nit Witt Ridge in Cambria Pines, California and SPACES Founder Seymour Rosen and includes an incredible depth of resources: extensive letters, photographs, and even Beal’s birth certificate. The effects of newsprint and other non-archival materials are seen here in this manila folder. Volume 122, Number 4 Issue of National Geographic from October 1962 that features an article with the Watts Towers. Jen has worked at the John Michael Kohler Arts Center as Education Specialist since 2013, planning public programs and education components around works featured in their exhibitions and collections, many of which include art environments. With access to the JMKAC collection as well as SPACES’ physical archives – as it continues to transfer to the Kohler Foundation, Inc. – she is looking forward to exploring a range of topics to broaden our reach and impact. Among her short-term goals are to feature contemporary artists whose work has been influenced by art environments and to offer resources for educators. She also hopes to continue to build partnerships with other academic and general organizations who work in this field. Jen holds degrees in art and education from Cardinal Stritch University (Milwaukee, Wisconsin), and strives to use points of universal accessibility of artist-built environments to engage people of all ages and abilities. In addition to her position at JMKAC, she serves as the museum representative on the Wisconsin Art Education Association board and is currently president-elect for the Dementia Care Network of Sheboygan County. The recent Road Less Traveled conference in Sheboygan, Wisconsin, hosted by a consortium that included the Kohler Foundation, Inc., the John Michael Kohler Art Center, and the National Center for Preservation Technology and Training, was the venue for the “official” announcement and celebration of SPACES archives partnership with, and move to, the Kohler Foundation, Inc. Scenes from the In Celebration of Ourselves exhibition co-curated by SPACES Archives, including the works of Sanford Darling, from his House of 1,000 Paintings + figure from Calvin and Ruby Black's Possum Trot﻿. In conjunction with the conference, SPACES Director Jo Farb Hernández worked with JMKAC curator Karen Patterson on two complementary exhibitions that drew from the archive’s resources – one focused on the Watts Towers and one that presented components of the groundbreaking In Celebration of Ourselves exhibition organized by SPACES founder Seymour Rosen for the San Francisco Museum of Modern Art in 1978. Hernández, along with all current members of the SPACES Board of Trustees – including John Foster, Lisa Stone, and Bill Swislow – as well as SPACES archivist Stacy Mueller, also participated in a panel discussion describing the work of SPACES archives, its development and evolution, and its plans for the future. More scenes from the exhibition, including early images from Watts Towers. Photo courtesy JMKAC. As this partnership with KFI develops and the physical archives are transferred to Sheboygan, SPACES staff and Board will continue to fulfill our mission of identifying, documenting, collecting information about, and advocating for the preservation of art environments all over the world. And as we continue to do so, we encourage all of you to continue to send us your photos, your texts, and any information you can uncover about art environments. This site has truly become a crowd-sourced resource, and we couldn’t do it without you! Thanks to everyone for your support! SPACES Director Jo Farb Hernández with SPACES Board Member Lisa Stone at the celebration honoring the transfer of SPACES to KFI. Photo by John Foster. Read more about the week’s events + the accomplishments of SPACES in this new piece by Hyperallergic. To see a video tour of the exhibition, view more on our Instagram feed. Today, we say farewell to our friend and former New Media and Communications Coordinator, Jennifer Joy Jameson, ﻿as she dives further into her responsibilities at the Alliance for California Traditional Arts. We’re glad to be able to continue Jennifer’s work by bringing a new person onto the SPACES staff to aid in accessibility and visibility for the organization as it transfers operations to the Kohler Foundation. 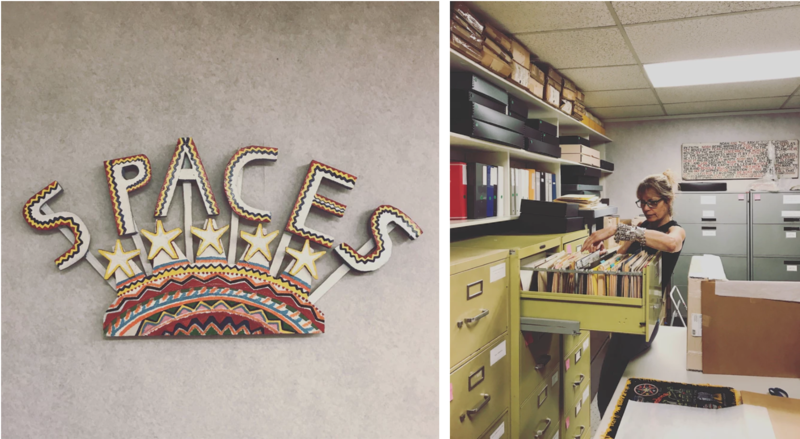 SPACES - Saving and Preserving Art and Cultural Environments, a 501(c)(3)public benefit organization, is looking for an individual who can combine digital media skills and an understanding of SPACES’s mission and goals to help us build new audiences for our organization. Familiarity with the genre of art environments and the fields of folk and self-taught art are preferred but not required. We seek a self-starter with experience in communications and digital media content development who can successfully promote and build awareness for the unique sites and environments that SPACES represents. With the new national and international audiences you build, we will expect to see significantly increased page views on our website (www.spacesarchives.org). This position is defined as an “independent contractor” and is expected to require the equivalent of approximately ten hours weekly; compensation will be negotiated commensurate with experience. The successful candidate will be reviewed after the first month, with a second review after six months. The New Media and Communications Coordinator will report directly to SPACES’s Director. The New Media and Communications Coordinator may work remotely from their home or business. > > > Click here to review and download the attached PDF for the full job description. There is a short window of opportunity to apply: Applications are due by Thursday, Oct. 5, 2017. SPACES, Inc. Moving to Wisconsin's Kohler Foundation, Inc.
(R) Executive Director Jo Farb Hernández at SPACES. Photos by Jennifer Joy Jameson, 2017. (R) Archivist Stacy Mueller and Executive Director Jo Farb Hernández at SPACES. Find out more about this exciting transition in the upcoming months. Please note that due to the move, SPACES is no longer able to welcome scholars and researchers to our Aptos offices. We will notify our supporters when the archival materials once again become accessible for study, but in the meantime, keep up with SPACES online! The Last Resort Lagunitas has a special place in the cultural landscape of the area of Marin County, California, as it exemplifies many of the traditions that originated and evolved in this rural area north of San Francisco, including the inception of the local environmental movement, the birth of a unique style of Arts and Crafts/Pacific Rim architecture, and the formation of alternative artistic currents growing from the counter-culture of the 1960s-‘70s. David Hoffman began to create this unique art site in 1973 when important cultural fermentations were taking place, drawing on the experience of his extended travels in Nepal, Bhutan, India, and China. In a unique and thoughtful way, he merged the ideologies and societal values of contemporary California with his own interest in the timeless Asian philosophies of life perpetuation and renewal, popularized at that time by the teaching of British philosopher Alan Watts. Hoffman fused these ideals within an array of structures that comprises the site; while reminding visitors of a multitude of world places and cultures, these structures are not copies of actual buildings but are rather the product of his memory, drawing from images of Buddhist temples, traditional rural housings, ancient hearth structures, and from an array of elements of the world’s traditions of tribal and folk art. Hoffman has intermingled all these influences while conducting personal research in order to transform this into “a totally sustainable site,” where the reuse of materials and the recycling of waste are central concepts for the design and construction of all structures. Hoffman has been working on the construction, updating, and maintenance of the site without interruption since its beginnings in 1973. SPACES sorrowfully announces the death of Board member Laurent Danchin, who passed away on January 10, 2017. Laurent served on the Board of SPACES since 2015, and was crucial in helping us expand our international reach to those interested in studying, documenting, and advocating for art environments. World-renowned for thoughtful and careful writings and curated exhibitions on a variety of art and artists, Laurent was particularly interested in the subject of art brut and art environments. He worked with the Collection de l’Art Brut in Lausanne, Switzerland; the Halle Saint Pierre in Paris; the International Museum of “Arts Modèstes” in Sète, France; and other institutions across Europe to curate a series of exhibitions on the field, annotating them with numerous articles, essays, and introductions. He published several books on art brut and post-contemporary arts, and his works appeared in more than a dozen countries. He was particularly instrumental in the preservation and advocacy for Chomo’s Village d’art préludien environment in France, organizing conservation efforts and thoroughly documenting the various stages of the artist’s expressions. The French editor for Raw Vision, a former journalist and radio/TV announcer, and perceptive interview for a range of creative people, he was also co-author of the website www.mycelium-fr.com. We already miss Laurent’s perception, thoughtfulness, and charm; donations in his name may be made to SPACES by contacting Director Jo Farb Hernández.